Yes, that is what the World is to me: Truly Fascinating, ever since my default view of it got boosted into extreme positivity by what doctors called a disease. 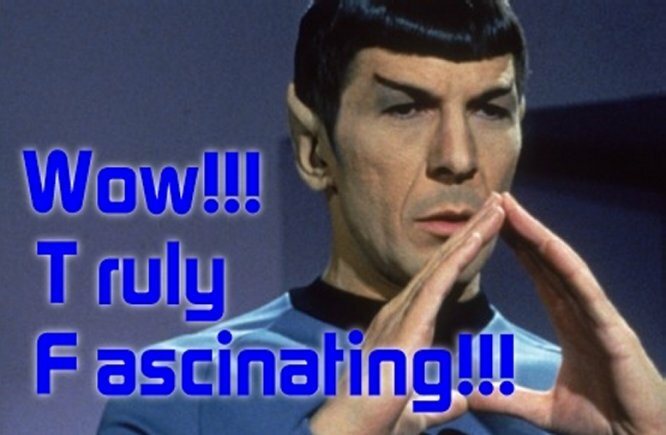 Sure, Mr. Spock's fascination was supposed to be far less exuberant, but still it is connected: In essence, his fascination is an expression of what he loves to study too! The entire world is one of choice, where we either say yes, no or maybe to the options life presents us. Of course choice itself is far more diverse, since the number of possibilities for any choice is essentially endless. Yes, even in the macroscopic world the observation principle of quantum theory holds: when unobserved, the number of possibilities is infinite, not even restricted to the Grand Overall Design.